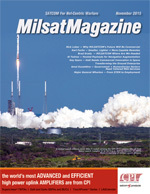 The current military satellite landscape continues to challenge defense agencies as they look for more practical methods to secure mission requirements, while dealing with limited budgets and evolving technology. When speaking with very small aperture terminal (VSAT) end-users and obtaining their feedback on what’s most important in next-generation technology, surprisingly, spectral efficiency and higher data rates do not top the list. As major Government and Military Satcom players gathered in London to discuss the industry and share ideas, what are the major issues still afoot in this turbulent sector? In September of 2015, the first European Geostationary Navigation Overlay Service (EGNOS) payload went live, providing improved accuracy of satellite navigation signals in Europe. A recent visit by Defense Secretary Ashton Carter to Silicon Valley focused a lot of attention on the government’s role in fostering technical innovation. Transforming The Ground Enterprise... , The simple ability to perform long-haul network transport and reconstruction of any signal brings disruptive innovations to the ground segment architecture and enables significant benefits. SpectralNet™ from RT Logic, a Kratos subsidiary, is a technology that digitizes and transports IF spectrum over IP networks in a way that preserves both frequency and timing characteristics, allowing the original signals and data to be recorded, broadcast, or processed at another location. SpectralNet brings analog IF data to the IP network world, as shown in Figure 1. In October, Thuraya Telecommunications Company—under the umbrella of the EMEA Satellite Operators Association (ESOA) and the Global VSAT Forum (GVF)—signed a Crisis Connectivity Charter in Geneva.